New Zealand Irish sympathies for Irish Fenian nationalists, who opposed British rule in Ireland, were expressed in the Hokitika newspaper the New Zealand Celt, and in funeral processions in February 1868 in honour of three Fenians hanged in the English city of Manchester. 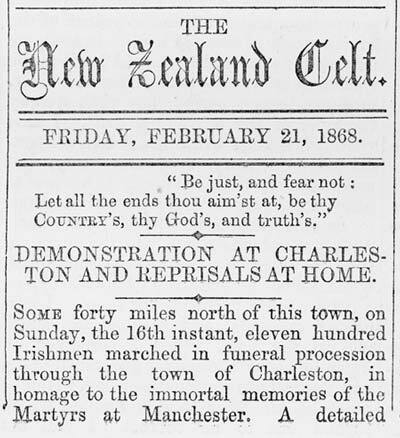 This report in the New Zealand Celt describes the Charleston procession. Reference: New Zealand Celt (21 February 1868).